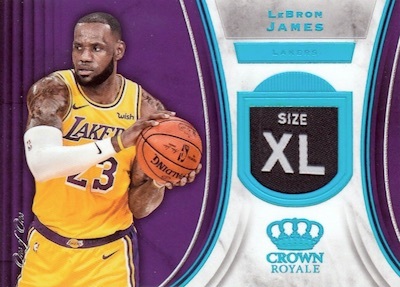 One of the most fun NBA sets each year as far as the designs, 2018-19 Panini Crown Royale Basketball mixes several popular elements in one product line. Matching the 2017-18 set, each Hobby box should have one autograph and one memorabilia card. Tapping into Crown Royale nostalgia, Panini promises a "robust" base set that features the famed die-cut design. Limited parallels include a Crystal finish. 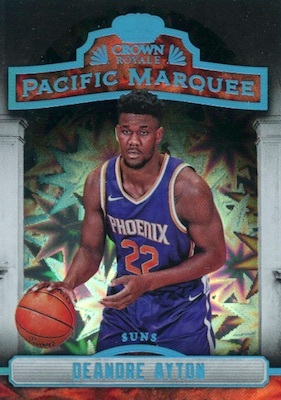 The 2018-19 Panini Crown Royale Basketball inserts opt for a more diverse selection. 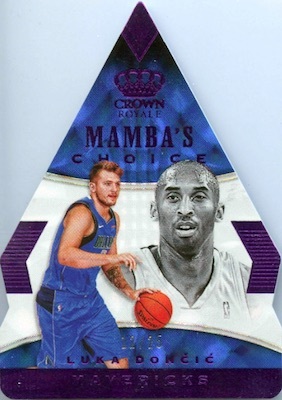 Die-cuts include Mamba's Choice, Panini's Choice and Rookie Royalty. On the other hand, Pacific Marquee gives top players cinematic treatment, while Power in the Paint goes really old school with ornate columns. 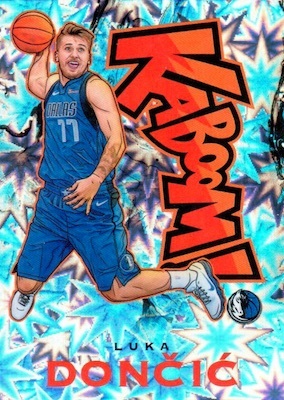 Highlighting 25 NBA superstars, Kaboom! brings the wild look and artistic style to basketball collectors once more. While new to Crown Royale, these rare inserts were previously in the Excalibur product. 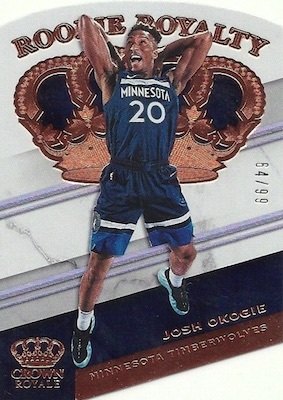 Another crowd favorite in the 2018-19 Panini Crown Royale Basketball checklist, Silhouettes covers top veterans and rookies with an on-card autograph and jersey swatch. Prime parallels are limited to 25 copies or less. Collectors can track down more signatures in Rookie Jersey Autographs, with Prime and Super Prime versions. And we can't forget the classic Crown Autographs, which makes good use of the die-cut look. 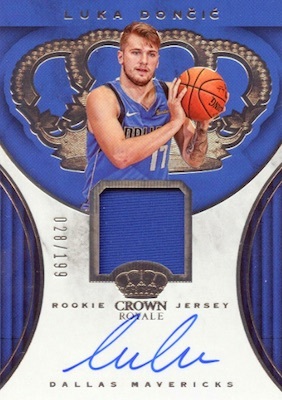 2018-19 Panini Crown Royale Basketball also has relic cards at an average rate of one per Hobby box. The Jerseys and Rookie Jerseys inserts supply most of the memorabilia in Crown, adding Prime and Tag parallels. CRYSTAL PARALLELS: Crystal #/99, Red #/49, Purple #/25, Gold #/10, Platinum 1/1. 40 cards. Serial numbered #/199. PARALLEL CARDS: Prime #/25, Super Prime 1/1. 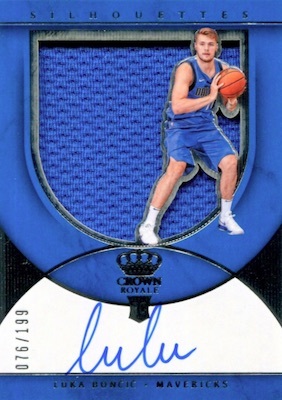 Buy 2018-19 Crown Royale NBA autographs on eBay. PARALLEL CARDS: Red #/49, Blue #/35, Purple #/25, Gold #/10, Platinum 1/1. 37 cards. Serial numbered #/149. PARALLEL CARDS: Red #/99, Blue #/49, Purple #/25, Gold #/10, Platinum 1/1. PARALLEL CARDS: Prime #/10, Super Prime 1/1. PARALLEL CARDS: Prime #/10 (No Elvin Hayes*), Tags 1/1. PARALLEL CARDS: Prime #/10, Tags 1/1. 10 cards. Serial numbered #/99. PARALLEL CARDS: Red #/75, Blue #/49, Purple #/25, Gold #/10, Platinum 1/1. View the 2018-19 Crown Royale Basketball checklist spreadsheet. LAST season of on of the best player ever D-WADE and no cards . ARE YOU SERIOUS ????? I rarely bought a case, but this is the first time I actually bought one last January 24, 2019. I absolutely love CROWN ROYALE and I tell you why? 2. Insert – glad they include KABOOM here. 3. Collation – average of one auto and one GU per box was right. There are even times there are two autos. This is like a Christmas gift from Panini to buyers. Not to mention most auto jersey are on card. 4. 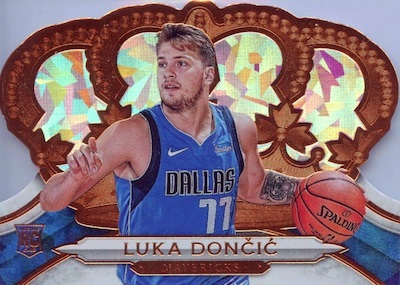 Luka Doncic – Panini is like printing money with him and the best way is to ride the wave. They should at least ensure there is one Luka auto per case that would entice people to buy one case. 5. Value – below $100 per box is worth it. Overall – if you are going to buy just one product for basketball. Then this is the PERFECT ONE. Hoping Panini keep on producing products like Crown Royale. Thanks. Too many 99cent autographs that are not even on card! You might get a parallel lower numbered card, but still of someone no one wants! Stick to rookies and stars only! Awsome product. I bought two boxs one have sexton silhouette on card auto other have Shaq silhouette on card auto and extrea Bamba sticker auto to 99. love it. good job panini good price poiont $94 each box. 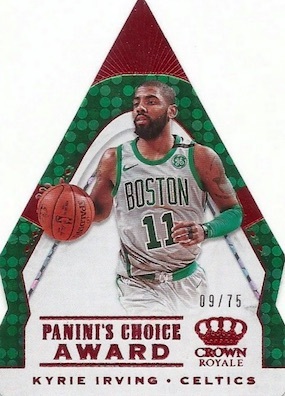 2019 Panini Best Product of the Year!!! Where can you get on card RCs with huge jersey patches at an affordable price? Most cards are numbered as well. Compared to other Panini sets with sticker autos and no number or jersey game used attach, this is absolute best product like Rookie Silhouette Autos or Rookie Jersey Autos. Future collectors would buy this one, since it is affordable now but 3 to 5 years from now this would become the most sought after.